Ultra fast trading leads to optimal locations for computer nodes. This is the beginning of a grid that will blanket the planet. One day the world could literally be covered in computers with major network hubs surrounding our planet in a fine meshed grid. What’s going to drive us to complete such a herculean task? Profit. Physicist Alex Wissner-Gross and mathematician Cameron Freer have discovered the optimal places on Earth for making split-second deals on securities. Their report, recently published in Physical Review E, is actually an economics paper. As Wissner-Gross and Freer explained to me in a phone interview, ultra-fast computerized trading has reshaped our world. When you start trading stocks at the speed of light, even small advantages in position can lead to millions in profits. 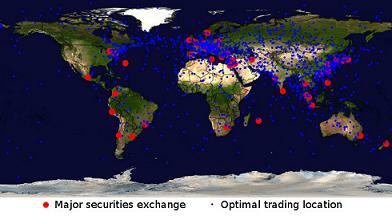 Businesses have sought out the best places on the globe to set up computer trading stations and reap the rewards. Wissner-Gross and Freer have the treasure map for this new financial world, and if you want to claim your share you’re going to need to understand the importance of trading stocks at the speed of light. We’ve put the stock market in the hands of computers, and only now is the public starting to understand what that means. When you picture institutions like the New York Stock Exchange, stop imagining a group of uptight men yelling prices at each other in a crowded room. That’s so 20th century. Now, the great majority of all trades are done by computers, and they can make deals faster, more often, and on smaller margins than humans can. This has lead to the rise in high frequency and low latency trading – why wait for the million dollar deal when you can make a million penny deals each second. More than 70% of our trading (by volume) already involves these computer-enabled high frequency sales, and in this brave new world being able to act a millisecond faster than the competition can mean hundreds of millions of dollars in profit each year. Wissner-Gross and Freer’s paper, Relativistic Statistical Arbitrage, deals with the fallout of these split second trades. Normal arbitrage is a pretty basic idea – you know that people in Tokyo value a stock at $2 a share, and you know people in New York are willing to sell that stock at $1.75 a share. If you can buy up the New York stock and sell it in Tokyo you can make a healthy $0.25 on every share, with little risk of loss. The person who discovers the price difference the quickest has the most chance of making the deal and collecting the rewards. But what happens when computers are trading millions of shares each minute? In the fraction of a second it takes for a computer to recognize a chance for arbitrage, a faster computer may have already acted on the deal and claimed the profits. Milliseconds matter. Millions of dollars are at stake. You want to get information as quickly as possible, and make decisions as quickly as possible too. Here’s the catch: even with information traveling at near the speed of light through the internet, it can take hundreds of milliseconds for data to get from one point on the globe to another. Traders that can place servers and lay fiber optimally across the globe to cut down on this time delay can therefore gain a crucial time advantage over their competitors. So, it turns out that if you want to make the most profit on the difference in prices between Tokyo and New York, you want your computer to be somewhere in the middle of the Pacific Ocean. There’s an ‘optimal location’ that will maximize a chance for arbitrage between those points. If you place your computer in the right spot you will be able to get information back and forth between your trading partners and make the best deal. Understanding all this? Great. Now let’s just expand this concept to the point of insanity. Start trading fast enough and even relatively small distances get to become really important. It’s not just Tokyo and New York, there are optimal trading locations in each country between cities, even inside cities. And every different kind of stock (or commodity or security) is going to have its own optimal locations based on the geography of supply and demand. Heck, those optimal locations even evolve over time as markets expand, shift, and decline. Wissner-Gross and Freer, with their understanding of physics, developed a way to find those optimal nodes. That alone could have been enough to secure them some tidy offers from major financial institutions (and they do have those offers in the works). But Wissner-Gross and Freer took it a step further and asked another question. If there is a best place to make money, what happens when people start building computers there? This is the relativistic part of Relativistic Statistical Arbitrage. We’ve see similar effects when dealing with bending, slowing, and even ‘stopping’ light in different mediums. Knowing how pricing information behaves like light could help financial institutions position their nodes, program their computers, and increase their decision making speeds to make billions of dollars in profit. Wissner-Gross and Freer throw around terms like ‘econo-physical’ and ‘propagation of tradable information’ to help describe the newly discovered importance of speed-of-light security sales. I’ll include another term: ‘eye-opening’. In the past five years (maybe longer in some cases), financial institutions have been pouring money into high-frequency and low-latency trading, restructuring themselves to take advantage of computerized arbitrage. They compete to find profits on smaller margins and higher speeds and could use Wissner-Gross and Freer’s paper to help them better optimize the locations for their computer clusters. In the past decade the effect of geography on computing has become very apparent. Big names like Google have placed their server farms strategically to get search results to users in tiny fractions of a second. The architecture for content delivery networks became (and continues to be) very important. Choosing locations for computer clusters will only grow more sophisticated as businesses opt to account for relativistic effects. There’s money to be made by building the best trading node structures, and so we’ll see them thrive in the years ahead. In fact, Wall Street companies have almost certainly done mammoth amounts of research into econophysical effects, but in secret (can’t let the competitors know what you know). Wissner-Gross and Freer are making this understanding public (and thus more scientific) and may be making connections between relativistic physics and trading that large corporations may already have explored privately. It’s important to remember that geographic considerations for computing extend far beyond Wall Street. Energy grids, distributed computer processing projects, telecommunication routing – these systems all have arbitrage-like opportunities inside them. One place needs power (or processing resources, or bandwidth) and another place has it. By finding the optimal way to exchange these resources we get the best possible deal. The ‘natural price’ for these commodities is reached quickly. So financial businesses and search engine companies may have started to build the computer nodes across the globe, but there will be many different industries that come to rely and profit by them. This will encourage the construction of more nodes, and in finer gradations. Eventually, and neither I nor Wissner-Gross and Freer have a timetable for this, the pressure to build trading nodes might encourage us to practically blanket the globe in computers. At some profit point having a computer perhaps every 100 kilometers will make sense. For some locations you’ll need many more points of presence (POP), and in others much less. Beyond that, who can say? Singularity enthusiasts may point to the day when we could have a continuous string of computers covering our planet’s surface. Yet there are strong limiting factors (power consumption, material costs, heat dissipation, etc) that will counteract economic pressures. Where those forces will ultimately find a balance is anyone’s guess. Before we reach that point, however, we’ll hit some changes that will be very exciting in their own right. Wissner-Gross tells me that we have major incentive to lay down fiber optic highways between cities and take advantage of faster data exchange rates to improve our trading times. Internet 2.0 is partially being financed by relativistic arbitrage. That’s awesome. And Freer explains how there will be philosophical ramifications as well. It used to be that location mattered. You built cities along major trade routes, and you put your house close to good roads. The internet has changed that somewhat: now anyone can work from home and telecommute to any city in the world. That will stay true, but in the world of high speed computing physical location stopped being trivial ten years ago. Where a server is located can be of great importance. Society was freeing itself of geography just as computation became chained to it. I am blown away by the need to conceive of stock prices as space-time events. Sit and think about that for a second. We’re using physics to explain finance. And not just economics, but general computational infrastructure, energy usage, telecommunications, and a dozen other fields as well. Wissner-Gross and Freer have presented us with a shift in how we should view the world. A small shift, perhaps, but a critical one. Most will probably not notice its importance because most have not noticed the growing importance of computerized securities trading. For those who are wise enough to use it there lies the possibility of huge profits. For the rest of us, this research is still key because it sheds light on how the public must rethink trading now that computerized transactions are the norm. Also, inside of this research lies the foundation for a computerized planet. With so much money to be made such a future almost seems inevitable. Thanks Alex and Cameron, you may have just pulled the Singularity a little nearer.